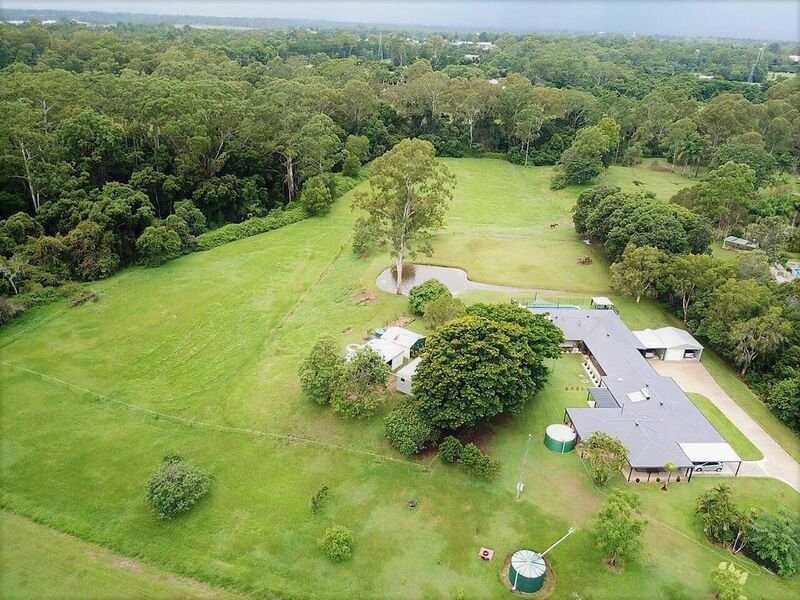 Nestled in beautiful bushland and only 5 km from the Caboolture CBD, is this unique and beautifully appointed holiday home on five secluded rural acres. Boasting the peace and serenity of a rural lifestyle, we are only a short drive away from all local attractions and exciting activities within the Moreton Bay Region. Bellmere on Richards' location is a 50 minute drive from Brisbane International & Domestic Airports, 7.8 km from the Caboolture CBD & Hub, a short drive from the $17m Queensland State Equestrian Centre, 25 minutes from beautiful Bribie Island and we are conveniently located at the southern end of the Sunshine Coast. The home features a modern fully equipped gourmet kitchen with dishwasher, microwave, fridge-freezer, oven and cooktop. Four spacious bedrooms boast luxury beds and bedding, ceiling fans, built-in wardrobes, full length wall mirrors, extra pillows, reading lamps, clock/radios, universal phonecharges, block out blinds and curtains with all linen supplied. Two beautiful bathrooms have quality inclusions with towels, bathmats, hairdryers, liquid hand and shower soap being provided. Our location has lovely surrounds on five acres with gardens, a small orchard, resident native wildlife such as kangaroos and an abundance of birdlife, whilst the property is bounded by Wararba Creek. Bellmere on Richards Rural Getaway is located at the southern end of the Sunshine Coast in the beautiful Moreton Bay Region and north of Brisbane in South-East Queensland Australia. Each bathroom has a full size shower, beautiful hand basins, towels & soap, hair dryer, hand soap, toothbrush holder, bin, hand towel & bath mat. Bathroom 1 has a shower chair & is wheelchair accessible. The property is bounded by Waraba Creek and bushland views. In the living areas only. Reverse Cycle airconditioning in the living areas. New front loader washing machine. Quality bath towles/sheets, bath mats & hand towels. Leather lounge suite, coffee table, flat screen tv with Foxtel, DVD player, guest compendium & travel magazines for Moreton Bay Region. Gas hot plates and electric oven. Fully equipped gourmet kitchen, coffee machine, full size refrigerator, electric fan forced oven, gas hot plates, range hood, dishwasher, rice cooker, electric wok, food processor, electric juicer. Dining table and bench seats with cushion padding. Flat screen with Foxtel and DVD player. Bathroom 1 is wheelchair accessible & has a shower chair. Beautiful home which had everything we needed for our break. This was our second stay and Vicki and Ken made sure we had everything we needed to ensure our holiday was perfect. Hope to go back again next year! It was an absolute pleasure having you and your guests stay Lee! We look forward to seeing you again next year. Beautiful, quiet and superb house in a magic location. Super clean, peaceful and has with everything you could possibly need to feel comfortable. We instantly fell in love with the relaxing feeling you got as we drove up the driveway & it was only a short drive from the city centre. Waking up to the sounds of the birds chirping & seeing the kangaroos outside our door was magic! The outside space is stunning with amazing views. The owners were simply wonderful and made us feel so welcome! A beautiful place that screams warmth & feels like home. Cannot wait to come back for a return stay. We were visiting the area for work and stayed here for a week. This place has the 'wow factor' and is simply perfection! The home has been tastefully renovated with everything new and has everything that you need when you're away from home. It was also fabulously clean too and had little touches like a welcome cheese & fruit platter, chocolates & flowers among other things! Absolutely delightful hosts who were so thoughtful and caring in their approach. They gave us a thorough rundown of the home features, what was available in the area and checked we were happy during the stay. We'll definitely stay again when in the area and highly recommend this place to others. The home is stunning, modern and spotlessly clean. Everything was super comfortable with great furnishings, decor, awesome kitchen and the beds were just perfect. The grounds here are enormous and perfect for the kids to roam about and there was even indoor & outdoor games for them. There is a great functional outdoor BBQ area that is undercover. Outback there are massive shade trees to sit under and watch the kangaroos coming though or read a book. There is also a dam full of native ducks which was entertaining for the kids. The owners are simply wonderful, they're there if you needed them, otherwise gave us lots of privacy. We loved it so much, we have already booked there for our next holiday later in the year. This place is a little slice of heaven. Our family had an amazing time staying here. Everything is set up perfectly for a comfortable and beautiful stay. Kangaroos are outback all the time which was wonderful to see. Great alfresco dining, magnificent gardens and so much outdoor space! Simply great. Certainly will not stay in motels after this place and can't recommend this place highly enough! Beautiful holiday accommodation that is definitely value for money. Everything about this place was comfort & a positive experience. The surrounds are stunning and the peace and quiet was great after a busy day out and about. Definitely worth considering for the gorgeous views alone. The onsite owners were lovely and it was evident they cared about their guests! Highly recommended.